This book offers a unique and comprehensive outline of the ethos, the bioethics and the sexual ethics of the renowned anatomist and founder of modern geology, Niels Stensen (1638-1686). It tells the story of a student who is forced to defend himself against his professor who tries to plagiarize his first discovery, the "Ductus Stenonis": the first performance test for the young researcher. The focal points are questions of bioethics, especially with regard to human reproduction, sexual ethics, the beginning of life and the ensoulment of the embryo, together with frontiers of pastoral care. The book delineates Stensen's ethos as well as its medico-ethical and theological implications and reception by researchers and physicians from the 17th century until today, and asks about his lasting significance. Despite dating back more than 300 years, Stensen's character and his work offer up surprisingly topical answers to current questions on the nature of professional ethics in medical science and practice. 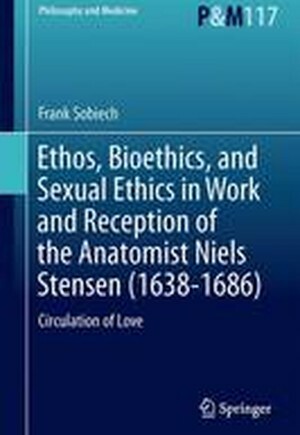 Furthermore, "Ethos, Bioethics, and Sexual Ethics in Work and Reception of the Anatomist Niels Stensen (1638-1686): Circulation of Love" is the first academic book on bioethics and sexual ethics with a foreword by the Prefect of the Congregation for the Doctrine of the Faith. A fascinating book for bioethicists, physicians, members of health professions, scientists, and theologians. Foreword.- Author's Preface.- 1: Basic Premises.- Structure of the Study.- The Life of Niels Stensen the Anatomist.- Applied Methodology and Sources.- State of Research: Niels Stensen in the History of Medicine and Medical Ethics.- Medical Ethos in the 17th Century.- The 'Republic of Physicians'.- Life as a Student and Researcher.- Medical Ethos in Its Relation to Theology Since the Early Modern Period.- Between Experience-Relatedness and Reflection in Faith.- Niels Stensen, Rene Descartes and Faith.- Niels Stensen and the Legacy of the Time of the So-Called Enlightenment.- 2: Ethos and Bioethics of the Anatomist Niels Stensen.- Research and Publishing in the 'Republic of Physicians',- Conflicts of a Student: The Blasius and Deusing Episodes.- Development and Progression of the Conflicts.- Plagiarism, Intellectual Property and Authorship.- As Student and Researcher: Personality and Research Ethos.- Intuition and Reflection.- Empathy and Caution.- The Human Brain as an Instrument of the Researcher.- Between Intellectual Heights and Self-Ignorance.- Precipitance and Pride as Obstacles.- Medicine, Patient and Creator.- Physician-Patient-Relationship.- Criticism of Contemporary Medical Craft.- The 'Dialogic Triangle'.- On the Metaphysics of Anatomy.- The Hand of the Anatomist and the Tradition of the "Haec Sacra".- Technique "in the Hand of God" (in manu Dei) in Service to the Creator.- Between Medicine and Theology.- The Beginning of Life: Research and Ethics.- The Discovery of the Ovary and Scholastic Tradition.- The Copenhagen Public Dissection of a Female Corpse in Comparison.- Physicality and Sexuality of Humans.- Conjugal Sexuality.- Simultaneous Ensoulment versus Successive Ensoulment of the Embryo.- Midwife Education and Dedication to Pregnant Women.- 'Demythicization' of Deformities.- In the Face of Suffering and Death.- Patient and Creator: On the Function of Anatomy.- The Spiritual Dimension of Disease.- Asceticism as Vicarious Atonement.- The Priest as Physician of the Soul.- Care for the Body and Care for the Soul.- Therapeutic Effect of the Sacraments.- Pastoral Border Cases.- 3: Niels Stensen's Character Sketch in History (17th-21st Century).- Talent and Originality.- Science and Humility.- The Convert as a Role Model.- In Public and in Politics.- In the Age of Technology and Memory of the Church.- 4: Niels Stensen's Lasting Significance.- Bibliography.- A. Archive Materials.- B. Photographs.- C. Primary Sources and Secondary Literature.- Abbreviations.- A. Abbreviations for Citations of Stensen Editions.- B. Abbreviations for Periodicals and Encyclopedia.- C. General Abbreviations and Symbols.- Index of Bible References.- Index of Named Persons.